This is the back story to the book Lean Is Not Mean. The leadership beliefs, behaviors, and competencies necessary to make Lean management a reality, is a field of inquiry that has fascinated me for 20 years. Beginning in 1994, I could see that some people in my management peer group were more successful than others at leading Lean transformations in their business unit. I wanted to know why. I did some research and found that there was almost no information on Lean leadership. So, I decided to establish Lean leadership as my research agenda. This led to the publication of nearly two dozen research papers and more than a dozen books. Lean leadership turned out to be a more fruitful field of inquiry than I had ever imagined. And the work continues. In January of 2011, I started my “Lean Leadership News” newsletters and delivered it to interested persons via e-mail (a push system). Feedback from readers shows that they really enjoyed my twice-monthly newsletters and found them helpful. Yet, e-mails are ephemeral and are forgotten or do not survive over time. So, I decided to collect the articles in book and thus created Lean Is Not Mean. The title of the book addresses the obvious shortcoming in Lean practice that we have observed over the last 30 years. Namely, Lean is widely perceived as mean due to layoffs and other zero-sum (win-lose) outcomes that employees and other key stakeholders have had to endure. Unfortunately, senior managers did not understand that Lean must not harm people. Or, if they did understand that, they ignored it to achieve short-term gains in financial performance. The harm to people caused by Fake Lean has long been a concern of mine. Lean is a human-centered management system. I wrote this books to teach managers even more about how to make the “Respect for People” principle – the “heart” of Lean – come alive. But, that is difficult to do. Managers at all levels misjudge Lean management and think is easy to understand and practice. The reality is that learning Lean management is more like learning to play piano well than learning how to ride a bicycle. 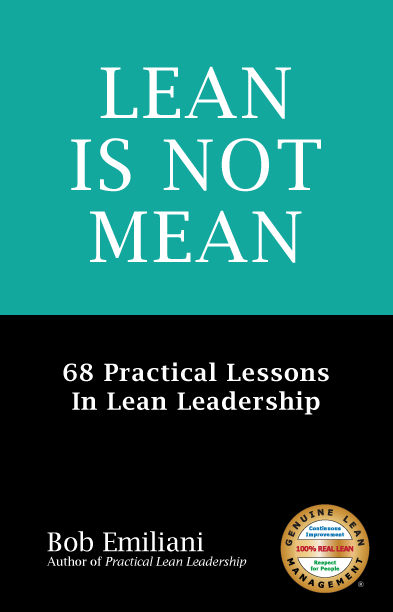 Lean Is Not Mean helps readers advance their understanding of Lean management and Lean leadership in ways that compliment other books that I have previously written. The book is meant to inspire readers to want to practice Lean the way a piano player practices every day. If that happens, then both comprehension and skill improve, which leads to better performance. Soon, daily practice results in a level of capability that attracts other people to participate in daily improvement and inspires them to learn Lean. Some will become Lean leaders as a result of the example that you set for them.